dôNrm'-lä-püsl, in which the great transgender activist and poet kari edwards encounters Joan of Arc with rare recognition and insight, as a fellow warrior and a rebel in kind. 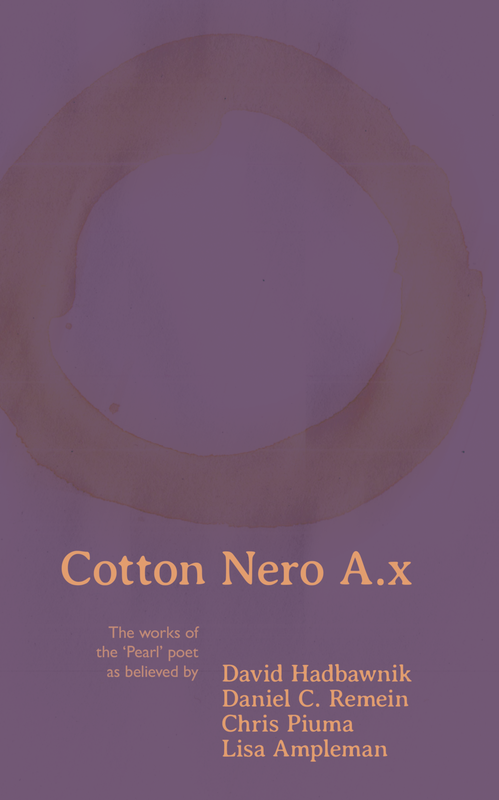 Cotton Nero A.x, in which David Hadbawnik, Daniel C. Remein, Chris Piuma, and Lisa Ampleman retrace the four major poems of the ‘Pearl’ poet (“Sir Gawain and the Green Knight”, “Pearl”, “Cleanness”, and “Patience”). snowline, in which Donato Mancini sculpts a neo-lyrical conceptual-visual eco-poem out of 40 translations of François Villon’s most famous line. Richard Owens’s Ballads sing, as John Latta says, “somber, sobering, post-glorioso warnings to the polis”. Unless As Stone Is, a serial poem by Sam Lohmann that emerges from a long entanglement with a sestina by Dante. kadar koli 10: Off the Books, a collection of poems, essays, and responses that emerged from and not from the 4th Annual BABEL Working Group conference.